All of us who have been doing genealogy research in the James Henry Smith line of our family has been up against a brick wall for quite some time. This frustration is shared among all of us! Recently some information has been stumbled across that can be considered a breakthrough of sorts. While all the questions are not resolved, we know more now than what we did. 1. Jane Harriet Smith-McAllister was thought to be the oldest child and the only girl...but was she? She was born in April of 1847. This fact was established in the 1900 census for Pulaski County. 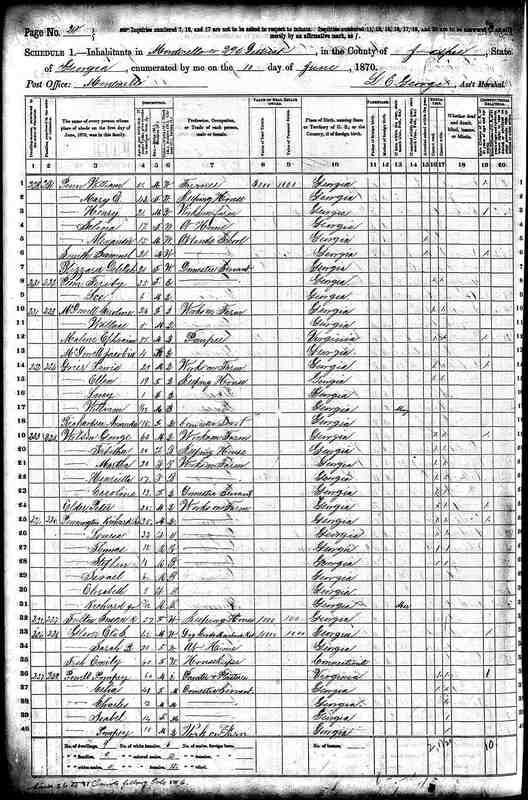 (It's hard to read) After looking at all of the censuses that she is in, her age always indicates that she was born somewhere between 1846-1848. Jane died on December 1st 1920. Her time of death is established from Tad Evans - DODGE COUNTY NEWSPAPER CLIPPINGS, VOL IV, 1920-1928, pg. 1709. 2. Samuel J Smith was the second born. He is buried in the Harrell-North Cemetery in Pulaski County. He was born on 02/19/1849 and died on 04/31/1892 according to the cemetery records. Since there are only 30 days in April, most likely there is a typo in the information and he died on 04/30/1892. His wife Charity Harrell-Smith was also deceased by 1930. 3. James Henry Smith was born third in 1853. He died on January 2, 1932. His burial place according to his death record is the Holt Cemetery in Pulaski County. He was living with his son John James Smith in Pulaski County during 1930 according to the census of that year. His wife Roxie whose exact death year is unknown was not alive at this time as James is listed as a widower. The rest of the John James Smith family is on the previous page for 1930. It is most likely that Roxie J Holt-Smith is buried in the Holt Cemetery. Mrs. Sarah Elizabeth Smith Ganas, 84, of 1730 Silver Street, died suddenly yesterday morning at the home of her daughter, Mrs. W.H.Williams of Crescent City, where she had gone for a visit. For the past 18 years Mrs. Ganas had lived in Jacksonville with another daughter, Mrs. Ethel Howard. She came to Jacksonville from Valdosta, GA. She was a member of the Baptist Church. She is survived by eight children, Mrs. Howard, J. Henry Smith, Clark Smith and Charlie Smith, all of this city; Mrs. Williams of Crescent City, Mrs. Ray Tedders of Pitts, GA; Mrs Lona Lewis of Sabastian, and Mrs Fannie Woods of Tampa; two brothers, William Holt of Eastman, GA, and John Holt of Rochelle, GA; 46 grandchildren, 55 great-grandchildren and seven great-great-grandchildren. Funeral services under the direction of Clayton Frank's Funeral Home of Crescent City will be announced later. - Jacksonville (Florida) TImes. So far Sarah's Holt family is not documented. It does not appear that she is a descendent of the William W Holt Sr. family. However it is likely that she might be a decendent of William Holt's brother James Holt who lived in Pulaski/Wilcox Counties? 1. Jane Harriet Smith-McAllister is living in Pulaski County with her son Amos J. McAllister. Her husband C Myers McAllister died three years prior to this time. Her info can be found in the 1920 census. 2. Samuel J. Smith died in 1892 but his wife Charity Harrell-Smith outlived him by 22 years. She died on April 25, 1920 and is buried next to her husband in the Harrell North Cemetery according to the cemetery records. 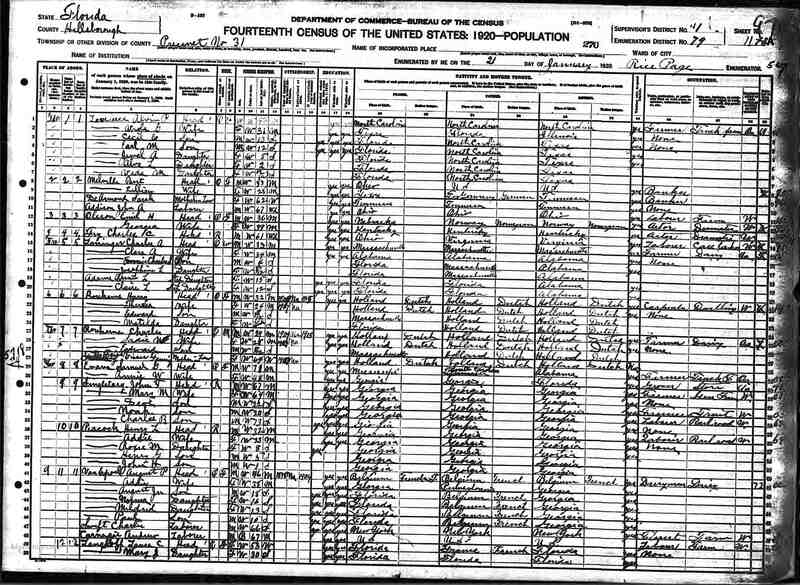 When the census takers made their rounds in 1920 in Pulaski County it was June and she was already gone. This has to be a typo in the newspaper, but her death date listed in the Harrell North Cemetery records conflicts with what is found in Tad Evans, Dodge County Newspaper Clippings, Vol IV, 1920-1928. 3. 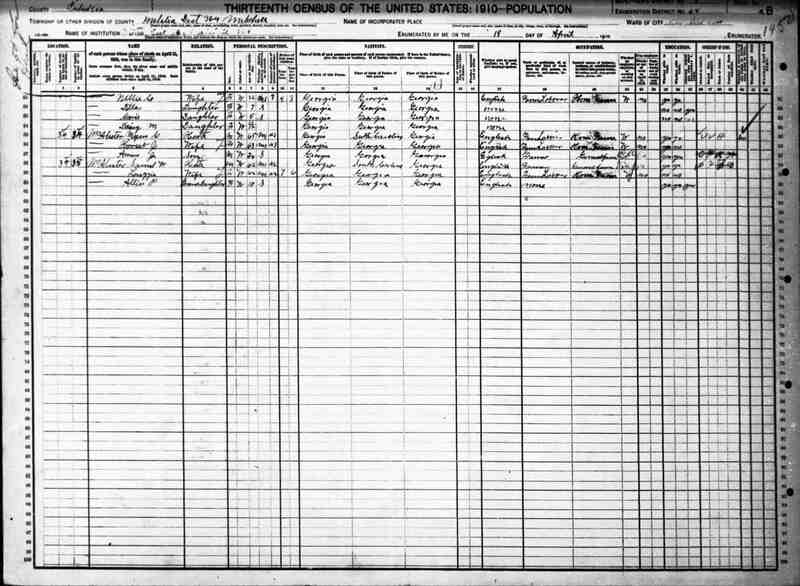 James Henry Smith was alive in 1920 but he cannot be found in the census. It is unknown if his wife Roxey died before 1920. 4. Charles D Smith cannot be found in the 1920 census as he was deseased by this time. His wife Sarah E Holt-Smith-Ganas had remarried and was living in Lowdes County by this time with a few of the children (Clark & Jesse) and some step children from her new husband. His name was R.C. Ganas. The census info for the family can be found here. 1. 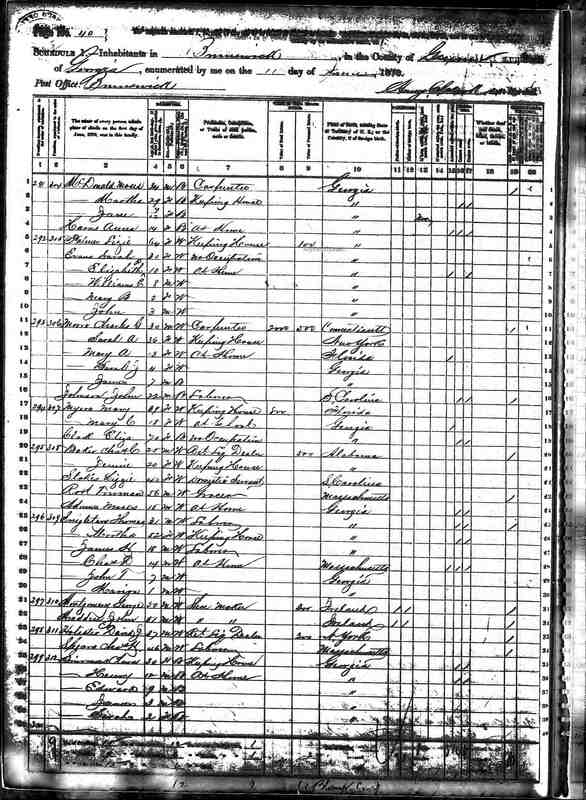 Jane Harriet Smith-McAllister is living with her husband C Myers McAllister in Pulaski County according the census of that year. 2. Samuel J. Smith died in 1892 but his wife Charity Harrell-Smith was alive and living in Pulaski County with two of her children. They can be found in the census here. 3. 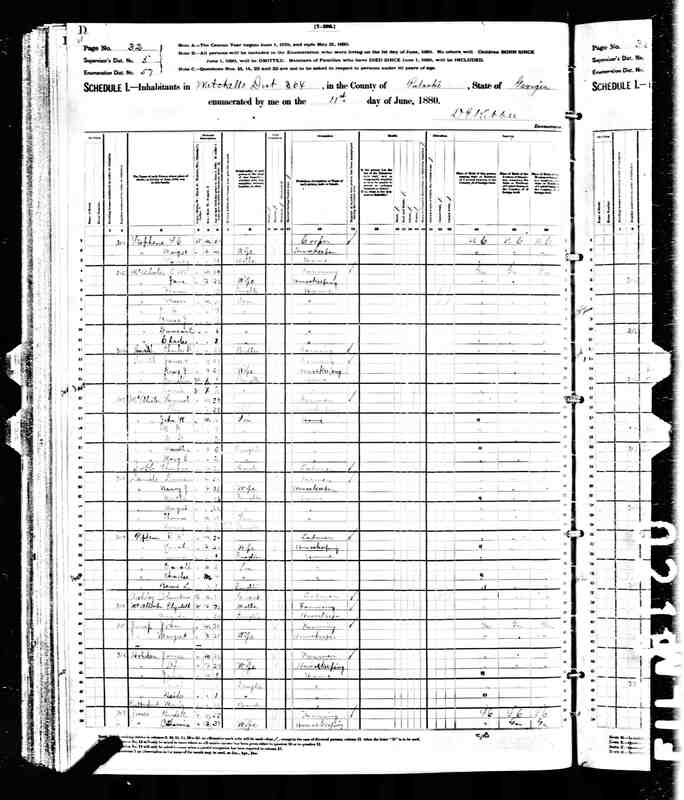 James Henry Smith and family can be found in the 1910 census. Grandson Lawton Henry Smith is living with the family. Lawton is the son of Cornelia Ann Smith-Young and an unknown Father. For the most part, Lawton was raised by James & Roxie Smith. 4. 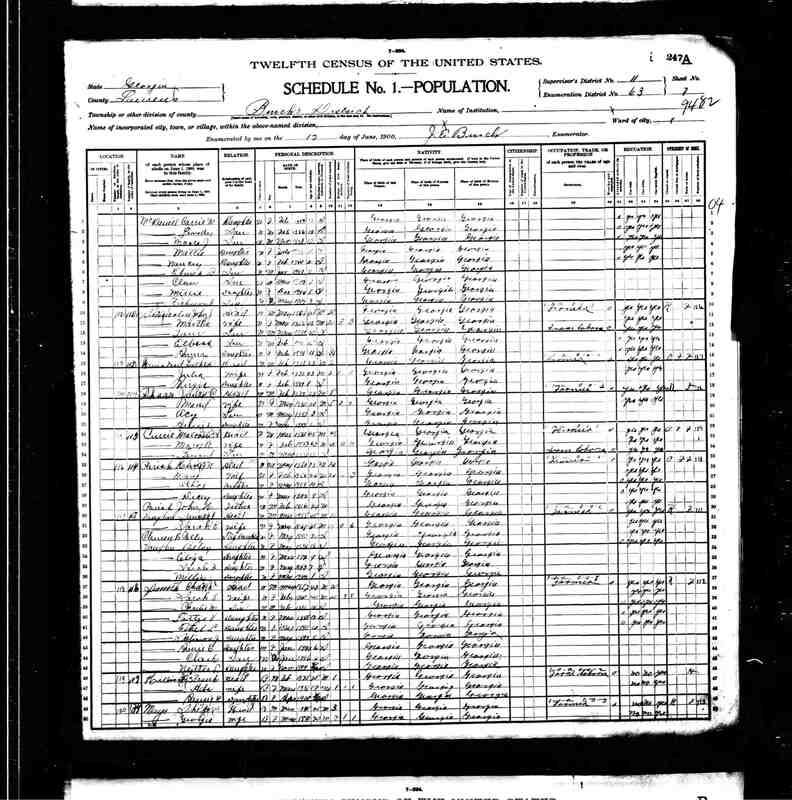 Charles D Smith's widowed wife Sarah Holt-Smith can be found in the 1910 census. She was living in Lowndes County with five of her children. 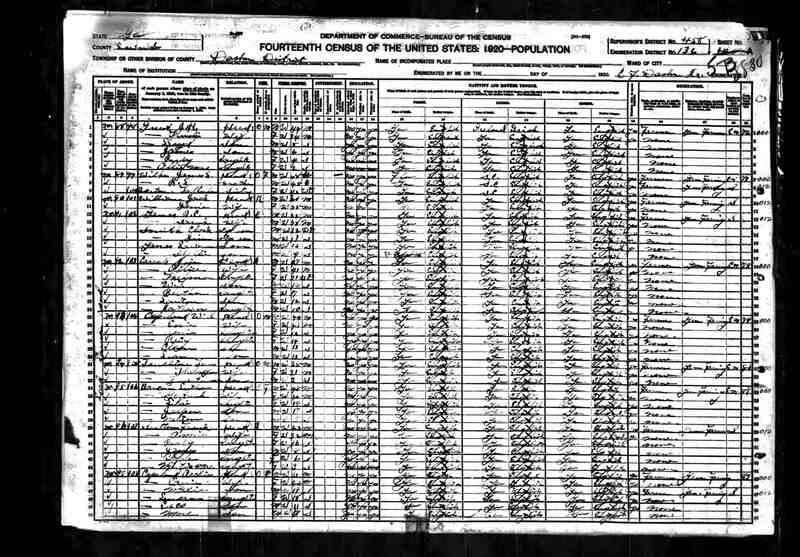 Charles D Smith died prior to this census. Most of the Smith family history from 1910 to present times is well known. Prior to 1910 only limited information could be found for the four known children; Jane, Samuel, James and Charles. This was for the 1900 census only. What we did not know was who the parents were for these four children? Were there any other siblings? Well, we still don't have a Father's name but we do have a Mother's name now. Her name was Martha A Bohannon-Smith-Singletary. We will continue to work backwards in history starting with the obituary for Martha Singletary. The following is from Tad Evans Pulaski County, Georgia, Newspaper Clippings, Volume V, 1898-1907, pg. 367. This obituary establishes the fact that Martha Singletary was the Mother of the Smith siblings. More information will follow regarding her maiden name Bohannon and her 2nd marriage to Thomas Singletary. 1. 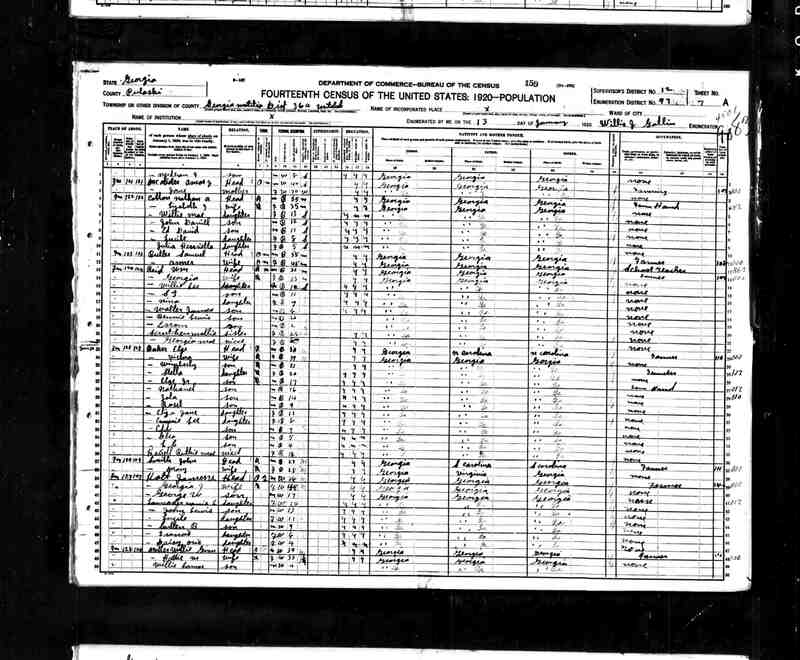 Jane Harriet Smith-McAllister is living with her husband C Myers McAllister and family in Pulaski County according the census of that year. 2. Samuel J. Smith died in 1892 but his wife Charity Harrell-Smith was alive and living in Pulaski County with her three children. They can be found in the census here. 3. 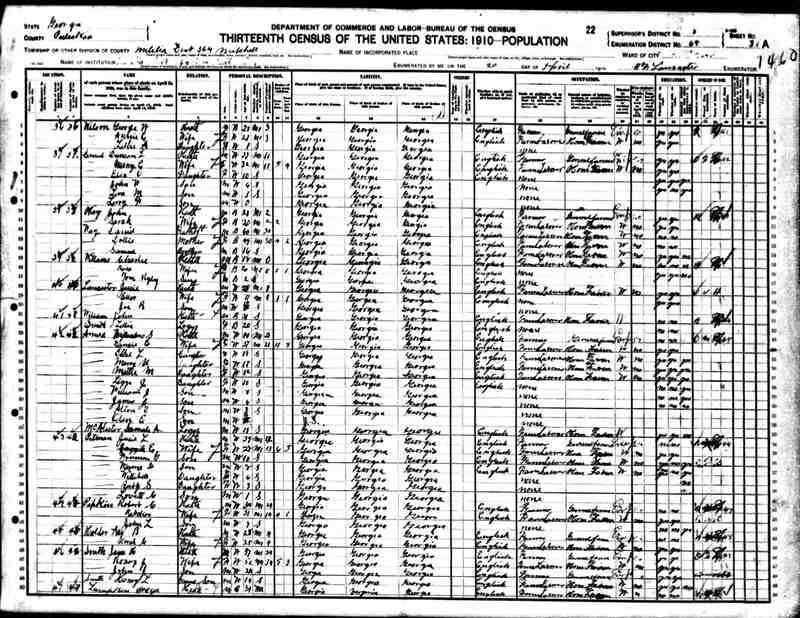 James Henry Smith, his wife Roxie, his three children and his Grandson Lawton Smith can be found in the 1910 census. 4. Charles D Smith was alive in 1900 and living in Laurens County with his wife Sarah Holt-Smith-Ganas and their children. 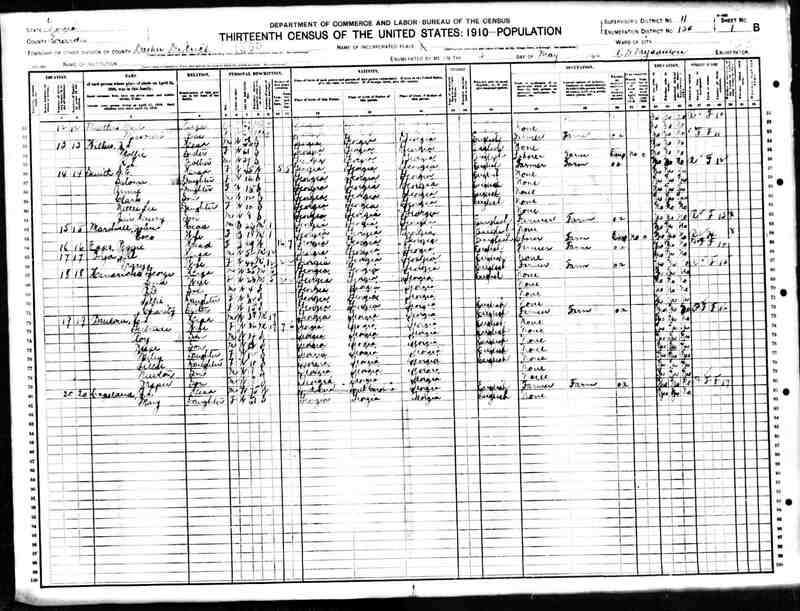 They can be viewed here This census provides proof that he was alive in 1900. His Mother Martha's obituary provides proof that he was alive in 1906 and living in Dodge County. Since his wife Sarah was living in Lowndes County in 1910, it is likely that after Charles's Mother died in 1906 the family moved from Dodge to Lowndes County. Another possibility is that Sarah moved there after the death of her husband to be near other family? Regardless, that is where she was living when she met and married her 2nd husband R.C. Ganas. 5. John T Singletary (born on 3/11/1863) a half brother to the Smith children was married and living with his wife Mary Missouri Giddings-Singletary and their nine children in Berrien County, GA. They can be found on the census here. 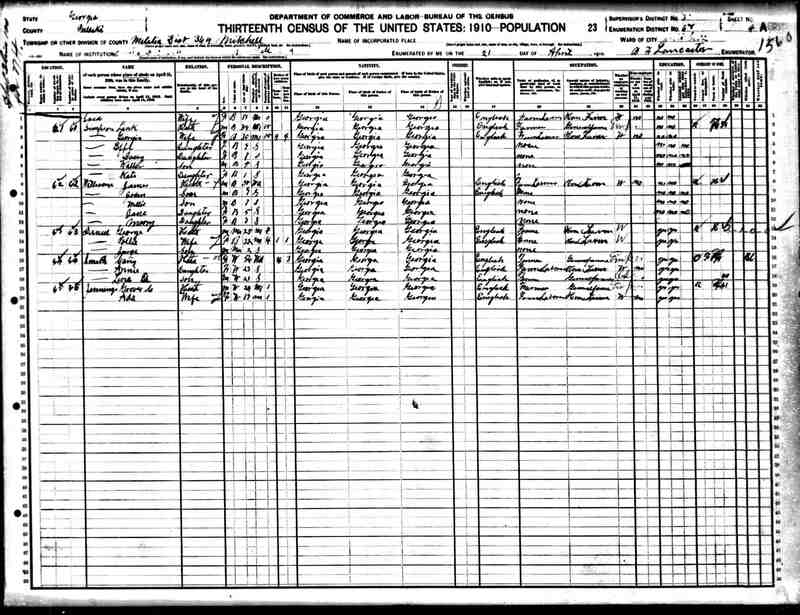 John & Mary's family can also be found in the 1910 census living in Lowndes County, GA and the 1920 census living in Hillsborough County, FL. John died on 10/26/1929 in Hillsborough County, FL according to this website. It is unknown when his wife Mary passed away. 1. Jane Harriet Smith-McAllilster was living in Pulaski County, GA with her husband C Myers McAllister and family. 2. Samuel J Smith was alive but would be dead in two years. He was living in Pulaski County with his wife Charity Harrell-Smith and their children. 3. James Henry Smith was living in Pulaski County with his wife Roxie and their children. 4. Charles D Smith's location is not certain. 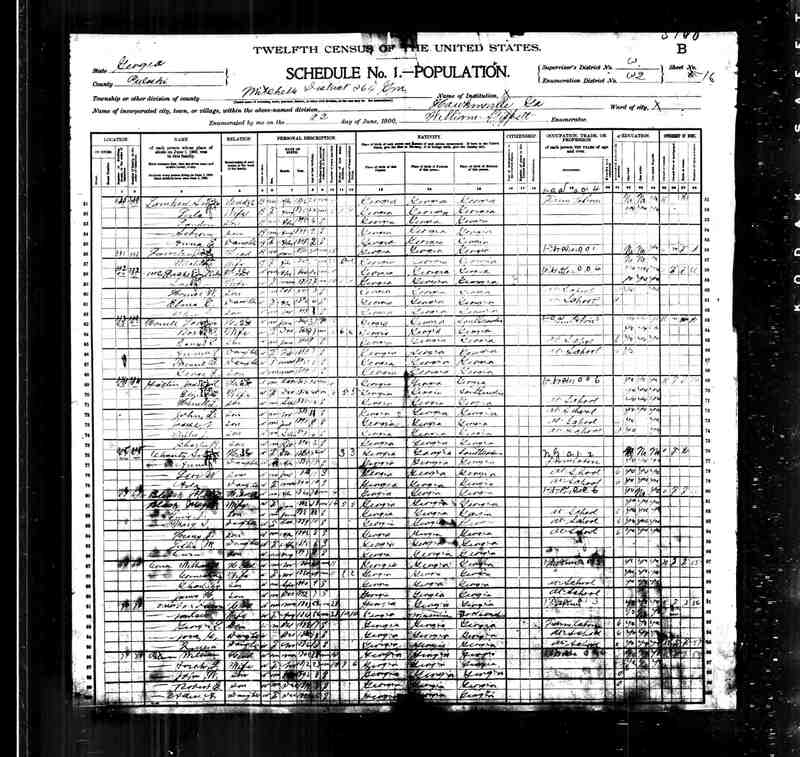 Since he married Sarah Holt-Smith-Ganas in 1881 according to the Pulaski County Marriage Records it is likely that they were living in the Pulaski/Dodge/Laurens County area. 5. John T Singletary was living in Clinch County, GA in 1880 and Berrien County, GA in 1900. It is possible that he was in either of these counties or someplace else in southern GA.
1. 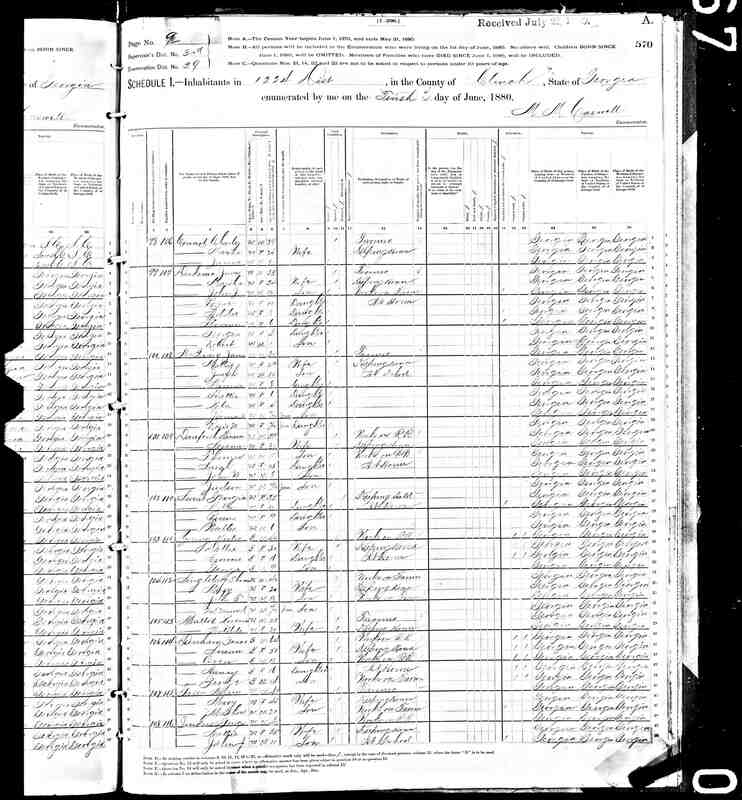 Martha A Bohannon-Smith-Singletary was alive and living with her son Samuel J Smith and a border according to the census that she is found in. By this time she was divorced from her husband Thomas Singletary. In the later part of the 19th century this was an unlikely event and it must have cast a stigma of sorts around poor Martha. 2. 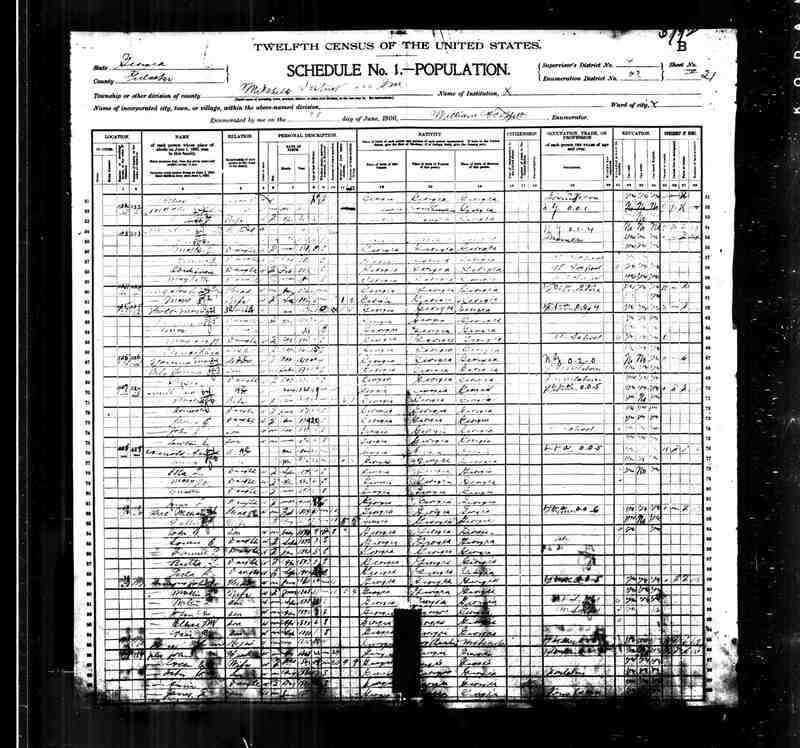 Thomas Singletary was re-married to a Mary Unknown and living in Clinch County, GA according to the 1880 census. 3. 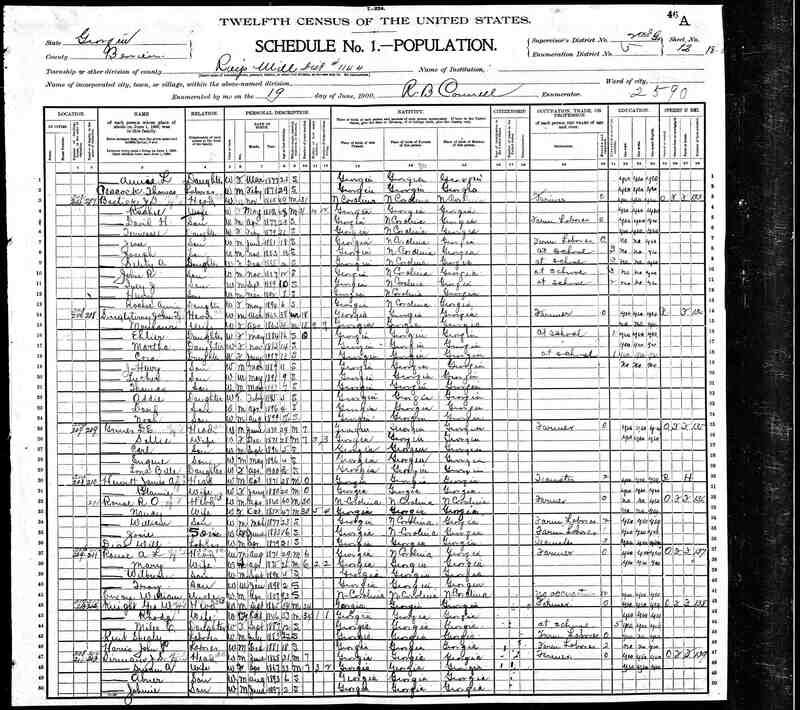 Jane Harriet Smith-McAllilster along with her husband and family are living in Pulaski County, GA according to the 1880 census. 4. 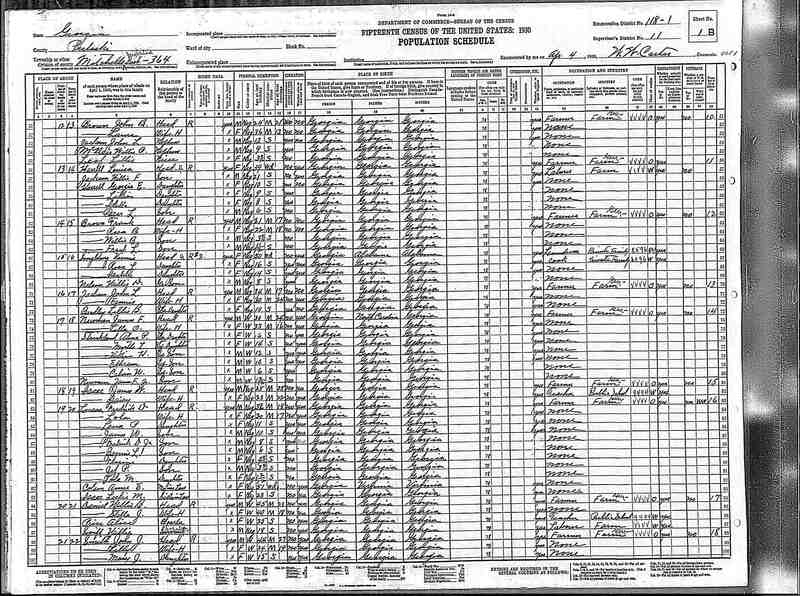 Samuel J. Smith was alive and and living in Pulaski County with his Mother, Martha A Bohannon-Smith-Singletary according to the census. 5. 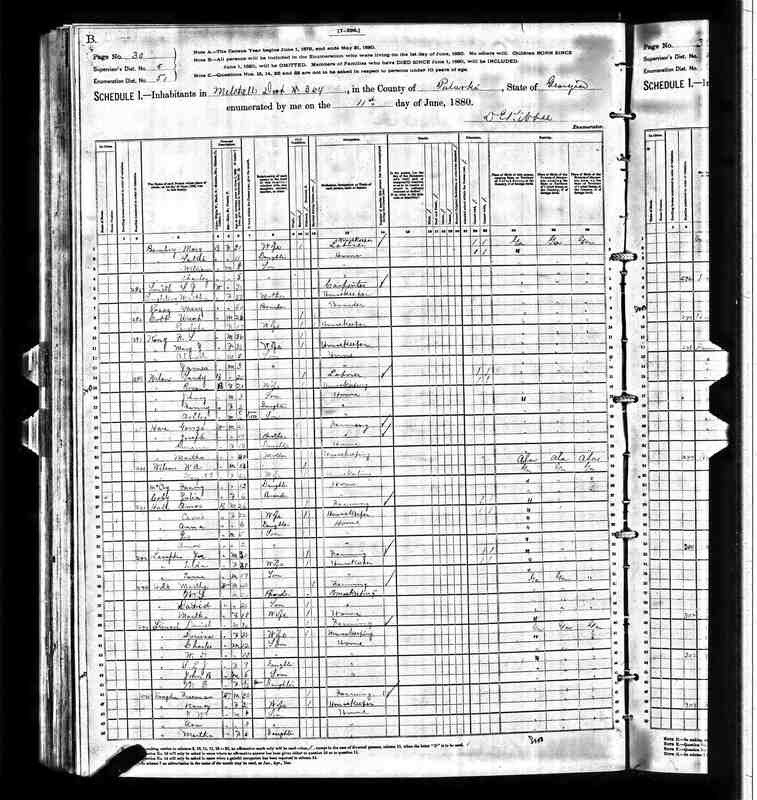 James Henry Smith was living in Pulaski County with his wife Roxie, their children and brother Charles D. Smith according to the census report for 1880. 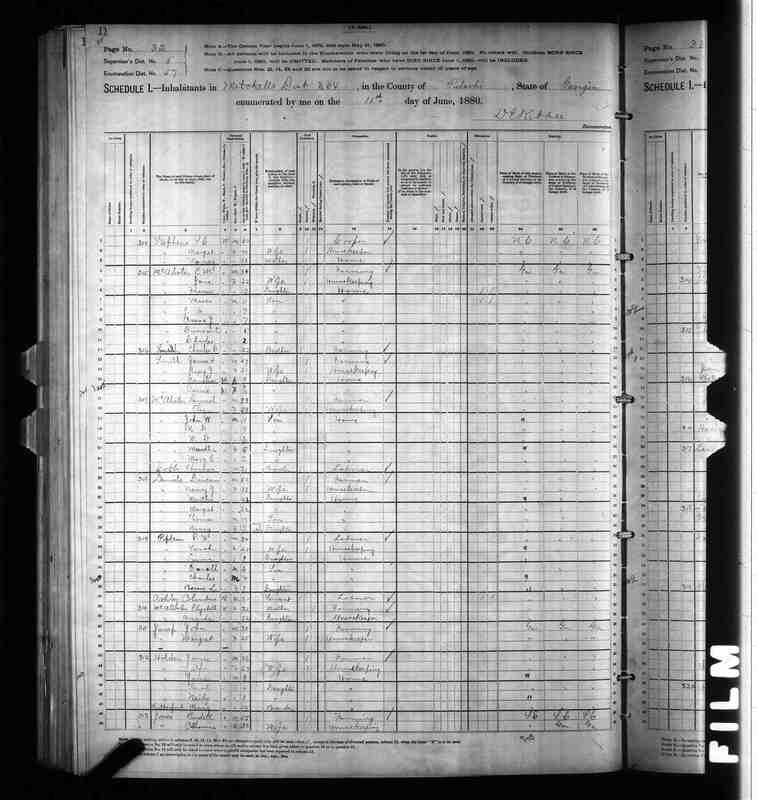 Note that the Smith Siblings James, Jane & Charles are all on the same census page as they were living near each other at this time. 6. Charles D Smith was living with brother James Henry Smith according to the census report for 1880. 7. 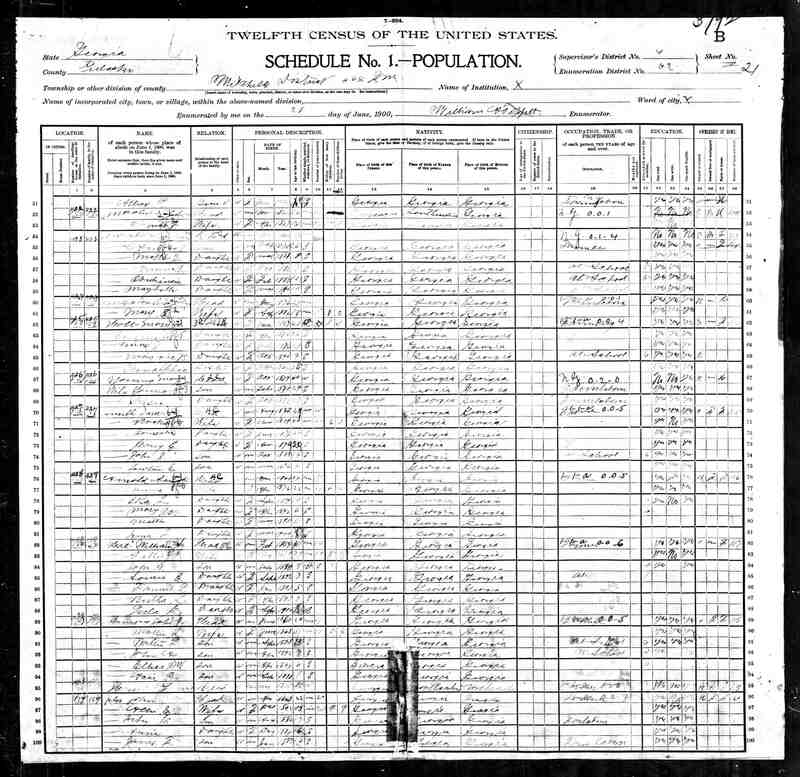 John T Singletary was about 16 years old at the time of the 1880 census. After his parents were divorced he apparently chose to live with his Dad. 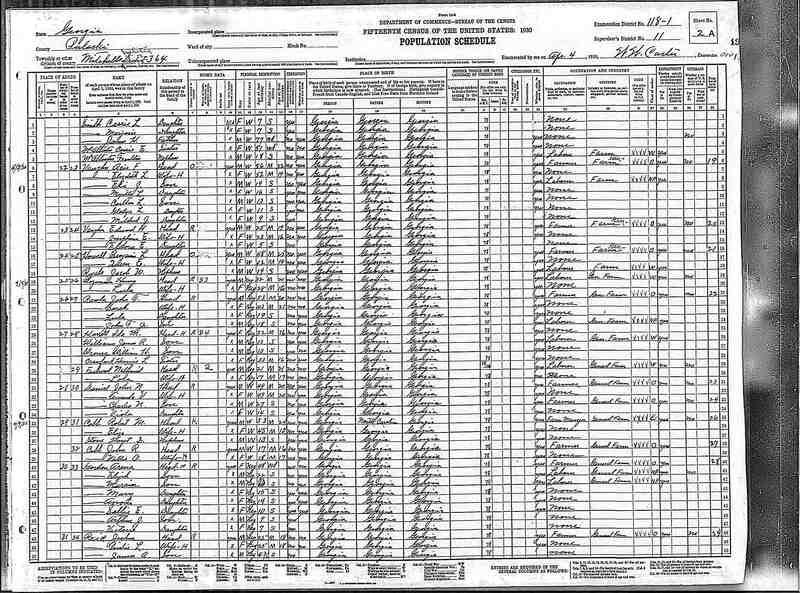 In this census report please note that there is a four month old baby boy living with the family. This child would be the son of Thomas Singletary and his new wife Mary Unknown. 1. Martha A Bohannon-Smith-Singletary married Thomas Singletary on 12/25/1860 according to the Pulaski County Marriage Records. Thomas was a veteran of the Civil War according to this website. Information regarding what unit he served in is not located yet. 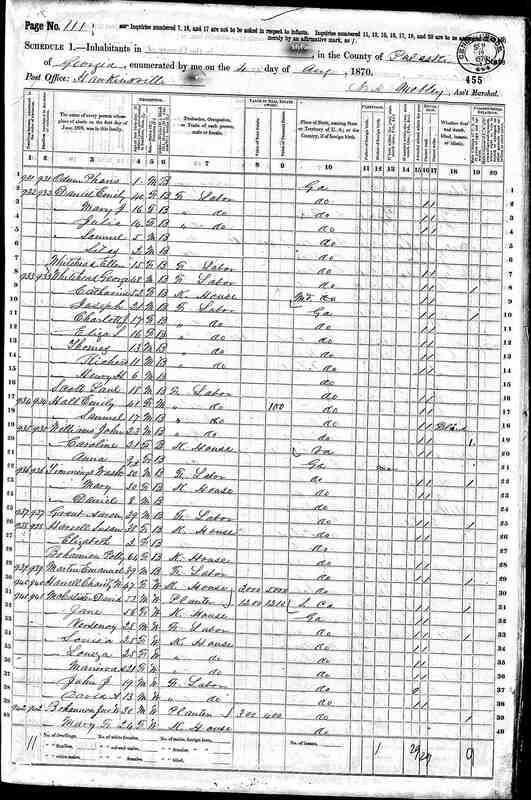 Martha and Thomas moved from Pulaski County and they were living in Glynn County, GA according to the 1870 census that they appear in. Notice that there is another son named Marion along with John Thomas Singletary living in the household. 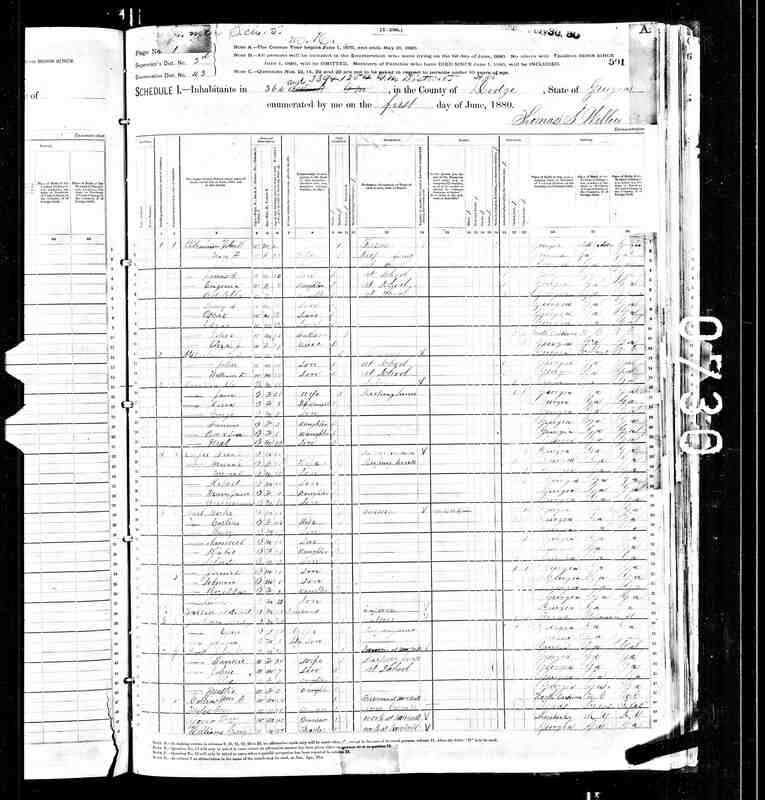 Apparently this child must have died between 1870 and 1880 as he does not show up in the 1880 census with either his Mom or Dad. It is possible that the death of a small child like this possibly could have contributed to the end of the relationship between Martha and Thomas? 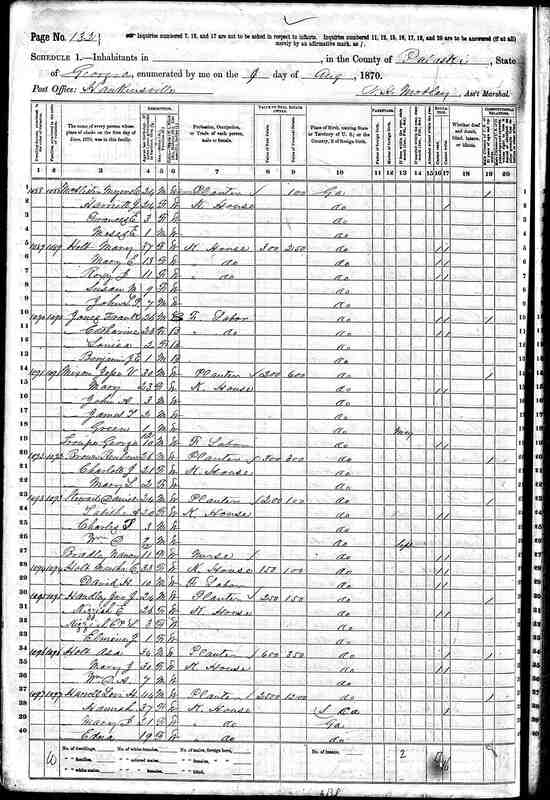 Another major item to note in this census, John Henry Smith and Charles D Smith are listed with a last name of Singletary. If you have ever tried to find these two brothers in the 1870 census searching on the Smith name and could not find them, now you know why! 2. Jane Harriet Smith-McAllilster and her husband Charles Myers McAllister were married on June 16th, 1866 right after the Civil War according to the Pulaski County Marriage Records. Charles Myers McAllister was a Confederate Veteran having served with Co. B, Anderson's Battery of the 14th GA LIght Artillery. The unit he served in was made up of many friends, relatives and neighbors. The roster can be viewed here. Jane, her husband and family can be found in the 1870 census here. 3. Samuel J Smith cannot be found in the 1870 census for certain. He was about 21 years old at this time. He could have been working as a farm hand away from Pulaski County or perhaps he was just missed by the census taker? 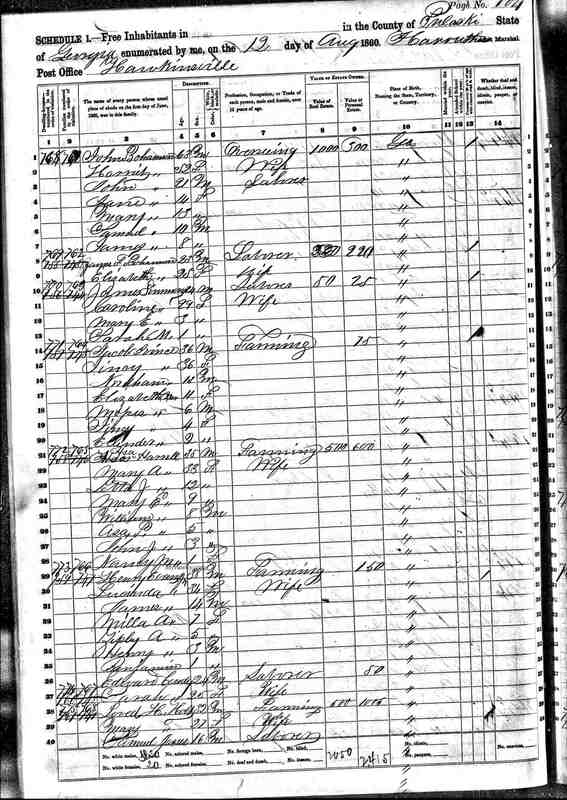 Regardless, there is a Samuel Smith that could have been him as the age is correct working as a farm hand for the Penn family in Jasper County, GA. (north of Pulaski county) He is listed with the family in the 1870 census . 1. Martha A Bohannon-Smith (did not mary Thomas Singletary until late 1860) was living in Pulaski County in 1860. It is unknown who her first husband was or where he was from but it seems likely that both Unknown Smith and Martha Bohannon-Smith were from the Pulaski County, GA area. By 1860 Mr. Smith was out of her life in one way or another. She was a single Mom with not four but five children! (maybe six?) 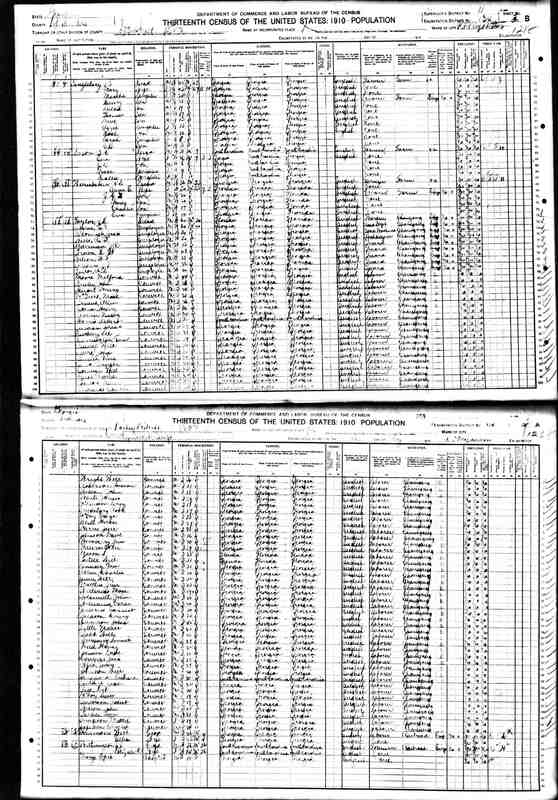 There is an older daughter named Sarah A Smith that is living with Martha, daughter Harriet Jane, Samuel J, James H and Charles D. This census like 1870 is misleading because the Martha Smith family is living with Martha's brother Joseph B Bohannon and his family. All of the Smiths except for Sarah A Smith are listed with a last name of Bohannon. It is the reason why the Smith siblings can not be found searching for the Smith name in 1860. Sarah A Smith is listed as being fifteen years old. This is only one year older than her sister Harriet Jane who is listed as being fourteen. This is a perfect fit and provides evidence that there were five Smith siblings and not four. 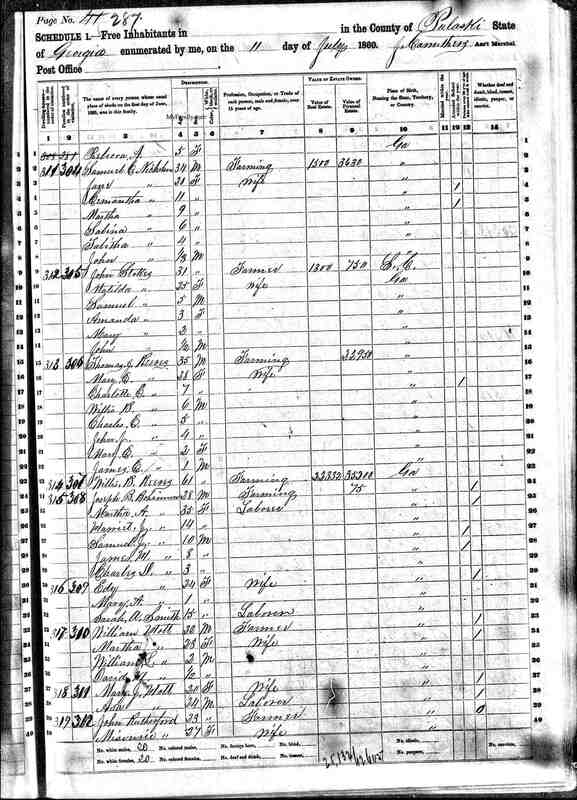 The census with the Smith - Bohannon families can be viewed here. To make things even more confusing for the 1860 census, three of the Smith children and possibly a third sister are listed again in the census for 1860 living with the parents of Martha A Bohannon-Smith. Notice the child named Mary, she is only one year younger than possible sister Jane and a few years older than possible brother Samuel. She fits into the age pattern perfectly. It also seems unlikely that she would be the child of Grandparents John and Harriet Bohannon due to their age at this time. 1. 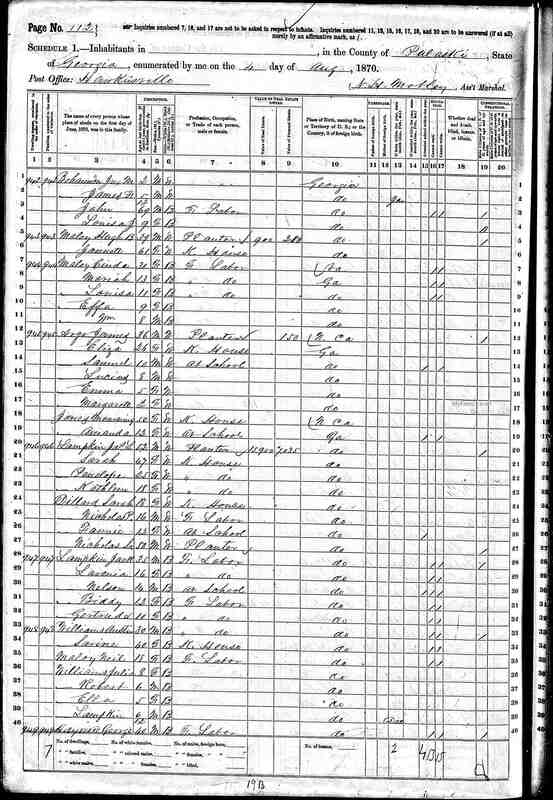 Martha Bohannon-Smith and her family cannot be found in the 1850 census. She should have been living with her Unknown Smith husband who had to be around until just prior to or for a while after son Charles D Smith was born in 1857. Since Unknown Smith is not with Martha A Bohannon-Smith in the 1860 census, it seems likely that he either passed away or otherwise disapeared from her life between 1857 and 1860. Another unfortunate piece of missing information is that her brother Joseph B Bohannon also cannot be found in the 1850 census. His where abouts might have given us an indication as to where to look for Martha. Most likely they were both in the Pulaski County area and not counted by the census takers that year. Another remote theory is that the family might have been living in Massachusetts during this time period. There is evidence of this if a close look is given to the census taken for the Thomas Singletary & Martha A Bohannon-Smith-Singletary family for 1870. Notice the birth location given for Charles D Smith. It is Massachusetts! Could the family have been living there when Charles D Smith was born? Perhaps that is where Martha's husband Unknown Smith ended up somehow? We may never know! The relationship for Mary Bohannon-Smith-Singletary to her parents John and Harriet Riggins-Bohannon and her brother Joseph D Singletary is established via the 1860 censuses because of where she and her children were living. Internet research of the Bohannon family looking at what other genealogists have found provides data to establish most if not all of the Bohannon family. This website provides excellent historical information. The family consisted of in chronological order parents John and Harriet along with children Martha, Henry, Joseph, Caroline, James and John. More information regarding the Bohannon family will be the subject of a future webpage.